The founders of North Town Wanderers (as they were called until 1887 ) worked in High Wycombe’s famous furniture trade. These men must have enjoyed 1877 a great deal because in addition to Wanderers FC, the town was also visited by none other than Queen Victoria, making a rare public appearance in her widowhood to honour the birthplace of the ‘Windsor’ chair.FN2 This industry would provide the club’s ‘Chairboys’ nickname. Like their idols Wanderers FC (who had disbanded by the time Wycombe started playing competitive matches), the furniture-makers aspired to the ‘gentleman amateur’ ideal. Although essentially working class tradesmen, they associated themselves with Buckinghamshire nobility by making their crest of a chained swan that featured in local heraldry. Wycombe Wanderers began competitive life as members of the Southern Football League from 1896 to 1908. By the end of this period, professionalism had insidiously entered the Southern League, just as it had the ‘Northern’ Football League in the 1880s (see Preston North End), prompting proud Wycombe to resign their membership on principle. They competed in several amateur leagues over the coming years, winning the London-area Spartan League in 1919 and eventually joining the Isthmian League for southern teams. Wycombe Wanderers would remain staunchly amateur until 1974 and only adopted semi-professional status that year because the FA announced it would no longer recognise amateur football. 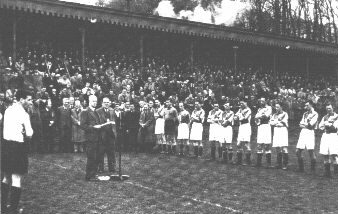 Playing in the combined blues of Oxford and Cambridge universities, in the leafy surrounds of their Loakes Park ground – owned by Lord Carrington, no less – the club were a time capsule of a bygone era, the days when football was a hearty pastime of the upper and middle classes. Such wistful idealism comes at a price, though, and the club had only brief periods of competitiveness. They won the FA Amateur Cup for the first and only time in 1931, beating Hayes 2-1 in the final at Arsenal’s Highbury ground. The following season they qualified for the FA Cup first round proper, taking Gillingham to a replay. They wouldn’t become Isthmian League champions until 1955/56, but retained their title the following year. This was under the management of former Man City defender Sid Cann who oversaw a nine-year period during which Wanderers were regularly challenging at the top of the table. They also reached the FA Amateur Cup final in 1957, losing 3-1 to Bishop Auckland in their first ever game at Wembley, and began to grace the FA Cup proper on a regular basis, reaching the second round in 1959/60 with a 4-2 win over fellow non-League side Wisbech Town before being eliminated by Watford. The 1970s saw another period of success. Wanderers won the Isthmian League four times in five yearsFN3 and had their best FA Cup run to date in 1974/75, taking Middlesbrough (seventh in Division One  that season) to a third-round reply after a spirited 0-0 draw at Loakes Park that was broadcast live on LWT. In the rematch at Ayresome Park, the professional side only progressed to the next round with a last-minute goal. However, the death knell was already sounding for Wycombe’s Corinthian spirit. Other non-League sides began to poach their undoubtedly talented players and, in November 1975, manager Brian Lee resigned after seven years in charge. The club were well supported home and away, but they declined to follow long-term rivals such as Enfield and Wimbledon into the nascent Alliance Premier League (founded 1979), England’s first truly nationwide competition for non-Football League clubs,FN4 because of concerns about travel costs. Such insular attitudes inevitably had to be rethought sooner or later. Wanderers were Isthmian champions again in 1983, but crowd numbers were falling. In 1985, after finishing third in the Isthmian Premier Division, entitling them to promotion, they finally deigned to enter the Alliance Premier League (or Gola League as it was known that year – how vulgar!). Relegation in their first season allowed them to win their eighth Isthmian title in 1986/87, before the club began their belated journey into the modern era. Wycombe’s progress under O’Neill was staggering. Finally resembling a professional football club, they won the Football Conference (as the Alliance was now known) in 1992/93, also claiming the FA Trophy (created in 1969 for semi-pro sides) in the process. This meant they entered the Football League for the first time. Wanderers immediately finished fourth in Division Three  to qualify for the play-offs and they defeated Preston at Wembley to earn promotion to the third tier, a level they would compete at for the next decade. They might even have reached Division One  in 1994/95 but for the chaos done to the promotion/relegation system following the foundation of the Premier League. That season there was only one automatic promotion spot while second through fifth went into the play-offs. Wycombe finished sixth. That summer the messianic O’Neill departed for an ill-fated spell at Norwich before he continued to work his miracles at Leicester City. O’Neill left Wycombe very much a Football League side, but professionalism has been a mixed blessing. I’ve been somewhat mocking of the various club administrators who collectively seemed to take a century longer than most clubs to start actually paying players. However, the two Isthmian League rivals I mentioned above as having made the step up earlier than Wycombe – Enfield and Wimbledon – have both gone out of existence since then, so perhaps the self-styled Wanderers were right to cling on to their Victorian values for as long as they did. Under the Trust, Wanderers narrowly avoided relegation in 2013/14 but have since stabilised in the league. Still fan-owned, the struggle to stabilise the finances is ongoing, but at time of going to press they have no plans to relieve the burden by returning to amateurism. FN1Of English football’s other ‘Wanderers’, Bolton used the term as an ironic reference to their difficulty finding a home venue, while Wolverhampton became Wanderers when they merged with a cricket team who styled themselves thus. FN2Windsor chairs were first produced in Buckinghamshire in the 18th century, but at the height of their popularity they were distributed from Windsor in Berkshire, hence the name. FN4Not to be confused with the short-lived Football Alliance, which ran from 1889 to 1892 and was made up of teams from the Midlands and North. FN5The first game at Adams Park was a friendly against Martin O’Neill’s former club, Nottingham Forest, still managed by O’Neill’s mentor, Brian Clough. FN6Steve Hayes was also owner of London Wasps, the rugby union team who had ground-shared Adams Park since 2002. Hayes sold both clubs in the same week. Wasps dropped the ‘London’ from their name and relocated to Coventry’s Ricoh Arena in 2014.